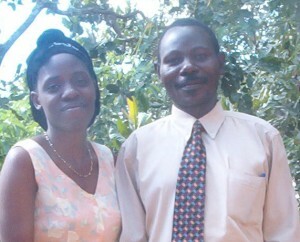 Biography: Edwin and Pascalina began New Covenant Church in 2005 through door-to-door evangelism. Edwin tells us, "We exist to preach the gospel, provide Bible-based teaching, regular family worship, and fellowship for believers of all age groups." The church is in a fast-growing area of Zambia, having gone from a thick forested area populated by 870, to a large town of 4,000. The church's focus is evangelism, discipleship, and prayer with a children's ministry and an active youth ministry geared toward Bible study, Bible quiz, and freer praise and worship. The church also has cell groups which meet during the week. Edwin and Pascalina's vision is to renew believers in the areas of prayer and joyful worship, so that they are examples to the children and to the world. Evangelism projects include church planting, discipleship, and gospel tract distribution. Strengths: Edwin's strengths are teaching, prophecy, and leading worship.